When Robert Ray, 75 moved into Macdonald Residence off West Burnside in 2003, his outlook on life was far from positive. “I never thought I was coming here to recuperate or get better,” Ray said. “My thought was that I was moving to Macdonald Residence to die.” Ray, who had relocated with four other residents from North Portland’s Patten Home was not receiving any medical care to treat his severe COPD, and because of other complicating issues, had no plans to start seeing a doctor. It was a very bleak time for Robert until he discovered that a Housecall Providers clinician, Gayle Miller, FNP was making house calls to the facility. “They asked me if I wanted to start seeing Gayle and emphatically I said yes, yes I did,” Robert continued. Sara learned that Robert grew up in Klamath Falls, OR but spent the large majority of his adult life in California where he had the unusual job of traveling around the Sunshine State fixing movie theater projectors. Now, due to severe back pain, Robert spends nearly 99 percent of his time in bed. He enjoys watching nature and car shows, but his true passion is keeping up with the news, especially anything to do with politics. “Robert will fill me in on all the high points of the day’s news when I see him. I can always expect a full report from Washington D.C. to Portland,” Sara stated. For years when Sara would examine Robert, she listened to him struggle for every breath. “Robert had terrible wheezing – his oxygen intake was at four liters a minute and oxygen saturation was still only 91 or 92 percent,” she said. Sara decided to put him on the steroid prednisone to decrease inflammation and in turn, open and relax his airways. People who are afflicted with COPD deal daily with the complications of their illness, guarding themselves against colds and other exacerbations (flare-ups) that can worsen their condition quickly and compromise their breathing even more. Nearly 15% of Housecall Providers patients’ primary illness is COPD. After sticking with this protocol, Robert began to experience relief from the wheezing. He now needs only two liters of oxygen a minute for his oxygen saturation to be in the 95 and 96 percent range. Although prednisone is not a good long-term medication because among other issues, it causes thinning down of the bones and joint capsules, Robert decided that the pros far outweigh the cons. “Gayle and Sara have taken care of every medical problem I have had. 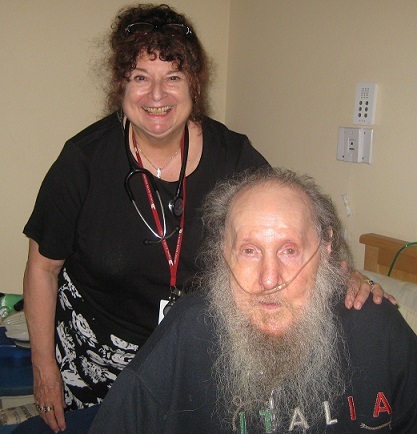 I know I wouldn’t be breathing if it wasn’t for Housecall Providers,” Robert declared. Sara takes a shot at enticing Robert out of his room twice a year, when her belly dancing troop performs for the residents and on Christmas Day when she and her husband play Santa Claus and hand out small gifts to the residents. Robert’s response is always the same. “I can’t come downstairs, but if you wanted to come up after and see me that would be fine.” Sara always does. “Robert tells me often that as long as he is breathing, life is good. He truly is the most contented person I know,” Sara said.